On time and balanced. That&apos;s how Democrats in the state Assembly highlight the state budget bill passed Friday evening. But Republican Minority Leader Jeff Fitzgerald has two other words to describe the plan: jobs killer. "We&apos;re not making it easy for working class families," said Fitzgerald. "If we continue on this course, there&apos;ll be no working class families, &apos;cause there&apos;ll be no jobs to go to. We have to quit demonizing businesses in the state of Wisconsin." Fitzgerald said the increase in the capital gains tax included in the $62 billion plan will hurt investors and small businesses. Madison Democrat Mark Pocan said the plan does what Democrats pledged they would do after gaining the majority in the Assembly: dealing with a record deficit, while protecting schools, public safety and health care, and shielding working families from big tax hikes. A family earning the median state income, said Pocan will pay "about 128 bucks" in new taxes and fees. "Given a $6.6 billion deficit, a historic deficit, I don&apos;t think that&apos;s all that bad." 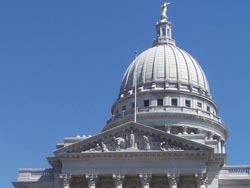 But the budget, the final details of which were worked out by Democratic leaders in the Assembly and Senate meeting behind closed doors, is "the little shop of horrors," according to Green Bay Republican Phil Montgomery. "Feed me, Seymour," Montogomery joked. The budget increases minimum car insurance rates, imposes more than forty new state mandates, and, insisted, includes some three billion in new taxes and fees, when combined with the February budget repair bill. "The monster of big government that is never enough," he said. "We&apos;re all going to have an opportunity to go home and talk to our constituents and make sure that they understand that this does protect working families," said Sheridan. "And as this economy recovers, people are going to look to see who rolled up their sleeves and got the work done." Sheridan said Democrats asked the GOP to partner with them on a budget but "they chose to sit on the sidelines." The budget, which passed on 51-46 vote, now heads to the desk of Governor Jim Doyle, who will have little time to consider vetoes in the two year spending plan, if he&apos;s to sign it into law prior to the start of a new fiscal year on Wednesday.